The agricultural industry was not alone in their enthusiasm for exploring trade possibilities once the Obama administration announced its plans to loosen the embargo against Cuba. In March of 2015, Cuba hosted almost a hundred agriculture industry ambassadors organized by the US Agriculture Coalition for Cuba in what Reuters reported as “The most important U.S. agricultural delegation to visit Cuba in more than a decade”. Knowing that Cuba’s agricultural system is vastly different from the U.S. – not only in terms of produce but also in terms of policy – I was interested to see how these two industries might interact. The interactive version of this research is live & can be explored further on Tableau Public. One of the first things I discovered was that, starting in 2000, the U.S. had actually already started exporting agricultural commodities to Cuba through an earlier relaxing of the embargo. Essentially, these goods can be sold to Cuba so long as no credit is extended. Still, according to Devry Boughner Vorwerk (chairwoman of the U.S. Agriculture Coalition for Cuba and executive to agricultural conglomerate, Cargill), Cuba represents an estimated additional $2 billion market. That coalition is experiencing a lot of support from corn and soy farmers and I wanted to see what their portion of this potential trade might look like. When I looked into the quick rise in exports to Cuba following the adjustments made to the embargo in 2000, I started to wonder if that reflected U.S. agricultural exports more generally. Despite a sense of the U.S. as increasingly less agricultural, I saw the export rate for these goods was increasing at a fairly quick pace across Cuba and the rest of the world. This growth seemed to be focused almost entirely on soy and corn products. Originally I had thought this might be attributed to increased chemical usage and, while there is an increase in the amount of chemicals, the rate stays fairly close to the increase in production. So I reviewed the USDA’s statistics on genetically engineered crops, and saw that corn and soy were also at the top of the list of GE crops. I wanted to showcase the central story here as the increase over time in production and the increased homogeneity. Originally visualizing this with a tightly spaced bar graph, I felt that applying the circle graph allowed for a more clearly perceived distance growing between soy and other production. Genetic engineering provides for a likely cause to this increase, but it didn’t seem as central to the larger story occurring between the U.S. and Cuba. Though I considered losing the heat map since it might come off as a repetition of the information above, I thought it offered a better understanding of why the U.S. doesn’t always feel like an agricultural country, since production is more concentrated. The next step to understanding potential U.S. agricultural trade with Cuba was to see if what we were exporting matched with what they were importing. I had previously heard praises of Cuba’s enlightened agricultural systems, using almost entirely organic techniques and featuring a strong urban agriculture presence, so I had doubts that it would be a good fit. However, it turns out that Cuba imports anywhere from 60-80% of their agricultural commodities yearly and that the top commodities imported match quite closely with the U.S. exports. I realized that certain historical events had been central to making Cuba’s agricultural system so unique. 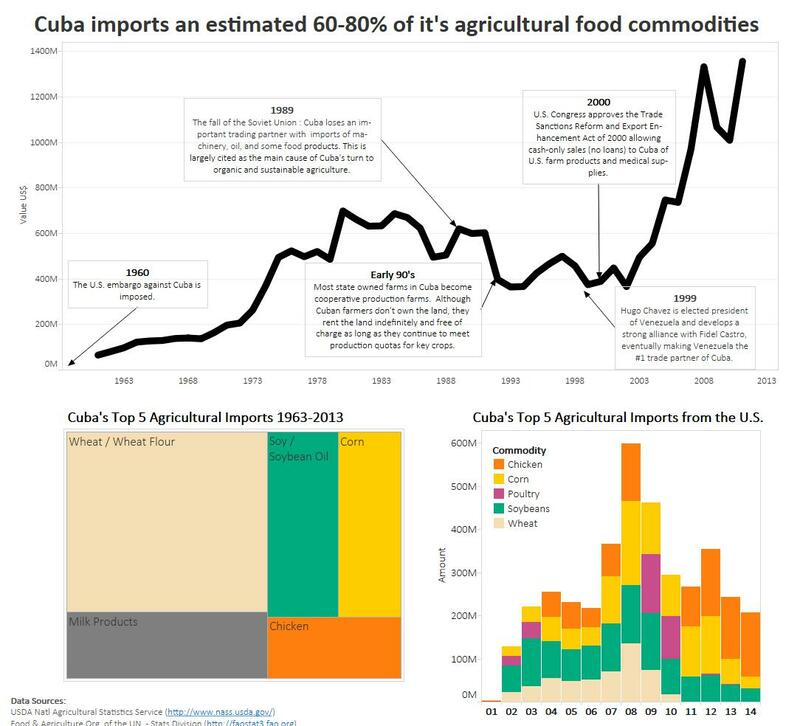 Recognizing this as so key to the story I was trying to explain, I decided this had to be the main component of the dashboard on Cuba’s history of importing agricultural commodities. Once this decision was made, the rest of my worksheet was significantly cleaned up. I realized I had been sacrificing the story to some gimmick of movement with the top five Cuban imports section. I opted instead for a stagnant frame of these top imports since they didn’t very much in terms of diversity, just in terms of rate of import, which was already shown in the timeline above. 1960: The U.S. embargo against Cuba is imposed. 1989: The fall of the Soviet Union means Cuba loses an important trading partner and imports of machinery, oil, and some food products. This is largely cited as the main cause of Cuba’s turn to organic and sustainable agriculture. Early 1990’s: Most state owned farms in Cuba become cooperative production farms. Although Cuban farmers don’t own the land, they rent the land indefinitely and free of charge as long as they continue to meet production quotas for key crops. 1999: Hugo Chavez is elected president of Venezuela and develops a strong alliance with Fidel Castro, eventually making Venezuela the #1 trade partner of Cuba. 2000: U.S. Congress approves the Trade Sanctions Reform and Export Enhancement Act of 2000 allowing cash-only sales (no loans) to Cuba of U.S. farm products and medical supplies. Setting the top five imports component to stationary allowed me to refocus the emphasis and give a more coherent backstory-timeline. Another exercise in streamlining and story control, came with the decision to narrow the commodity lists. Since the bulk of imports and exports are easily described within the set of top five, I was able to cut eye distractions within the fringe commodities and narrow my range of colors. Personally, I have a tendency towards an over use of colors that I have to actively restrain. Doing so had the added benefit of making it easy for the eye to see and remember just five colors and easily recognize the match between Cuban imports and Cuban imports from the U.S. 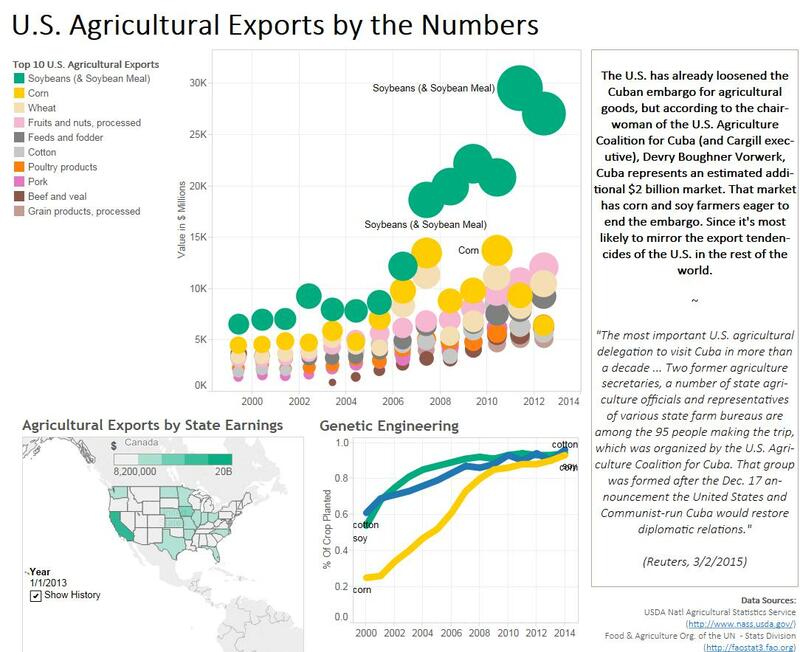 This allows it to become quite clear why Cuba represents such a huge market opportunity for U.S. agriculture. One component I was convinced to leave out after much hesitation is the reciprocal import trade from Cuba’s agricultural production. Visually, I had used color to denote commodity across both dashboards and this would have introduced an entirely different set of colors for the eye to adjust to. Furthermore – and perhaps more important to the story’s content itself – is that though climate and soil fertility makes Cuba a potentially useful importing partner to the U.S. , its current production rates are not as strong. Cuban farmers could potentially sell tomatoes and citrus fruits throughout the winter months to the U.S. but they cite issues with state control over other trade of machinery as getting in the way and this importing does not seem as central to the U.S. interests. Nevertheless, there are many strong points in Cuba’s agricultural system that are praised and studied throughout the rest of the world. The above mentioned import potential and a deeper study of Cuba’s strong organic and urban farming practices make up the next goals of my research, though data has so far proved somewhat difficult to locate. These next research points also represent a move in tone from industrial business understanding to a more anthropological lens. These viewpoints should be considered in tandem for a fuller picture of what these next years of embargo relaxation will mean to both countries. Frank, Marc and Daniel Trotta, “U.S. agriculture delegation visits Cuba, protests embargo.” Reuters. March 2, 2015. Miroff, Nick. “Why Midwestern farmers want to break the Cuba embargo.” The Washington Post. March 3, 2015.